We all have at least one, if not ten. That one spot you are dreading working on and just keep putting off and putting off. Some days it’s the dishes pile, some days its a stack of kids papers. Or maybe you have a closet, junk drawer, or a catch-all surface you can’t keep clear. 1.) It takes less time to clean than how long you spend thinking about it. Chances are, it will take you less time to clean the spot than the time you are spending worrying on it. Interesting, huh? Time yourself and see. Even if it takes an hour to do, it’s worth not thinking about it a few times a day, each week. If you’re having a hard time starting, start a timer or stopwatch on your phone. You’ll be surprised at how much you can do when you are focused on a single task. You might even be surprised how quick it takes. If it is something that will take a long, long time, chip away a little at a time. Yes, I realize I’m probably cheating by including this as a tip, but oh well! Just start. Seriously. Do it. Do it today. Chip away at it a little bit at a time. Give yourself a deadline. Don’t like deadlines? Give yourself a reward for finishing. 3.) Make a date with your spot. As silly as this sounds, pretend like cleaning your spot is some big event you’ve been looking forward to. Shower, do your hair, makeup, get dressed, pour a cup of coffee, light a candle or diffuse some oils nearby, turn on some of your favorite music, and go at it! Time yourself, make it an event you’re looking forward to and as crazy as it sounds, it’ll be more enjoyable. All of us could stand to do some decluttering. 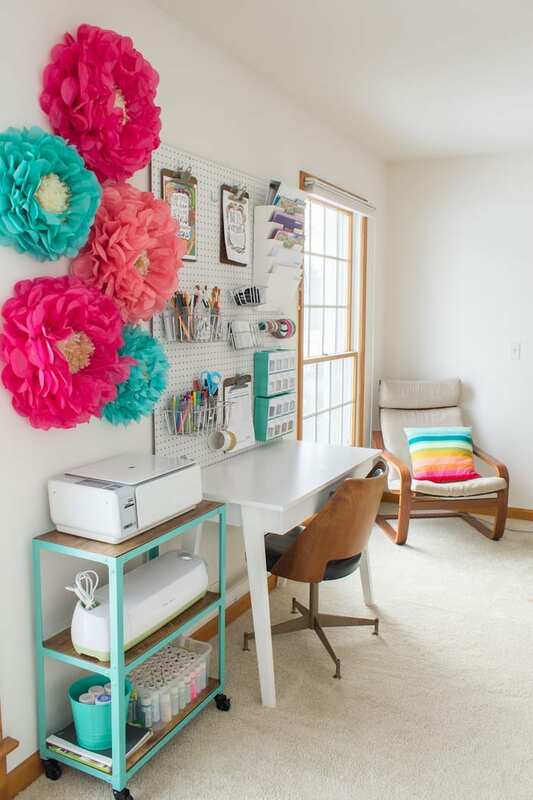 If your space is overwhelming, you probably need to reduce what you have in that spot. If something is useful, pretty, and has a spot, keep it. Put spare change in your car’s change container. If you need it, put it away the second it touches your hand. Do you care enough to find a spot for it? Find that spot now and quit shoving it in a drawer. Are you storing a bunch of odds and ends for years on end without much use? Free up your drawers and donate, recycle, or just trash them. If it can be easily replaced, pass it on. (You are not a store!) If it will help someone else, pass it on. Do you not know where to put it or where to store it? Let it go. Be ruthless with things you are not using and ask yourself the last time you used it. Ask yourself when you will use it next. If you don’t know the answer to either, your decision is clear. 5.) Put things away with your first touch. I didn’t realize how bad I was at this until I started paying attention to what I was cleaning up. It was me! I’m setting down items while moving to the next item to put away, and that’s gotta stop. When you touch an item, try to put it away right away! When you are cleaning your spot, avoid piling items up. If you are are in a deep, deep declutter and have many items going to the same spot, only make small piles. Don’t wait until the end to put them away, take breaks to put items away before the piles get too large (aka overwhelming). 6.) Find Out What Isn’t Working and Fix It. Make a list of what is and isn’t working for the spot. First, try to find solutions with things you have on hand. For example, I couldn’t find a spot for our shoes and remembered we had these cool wine crates. 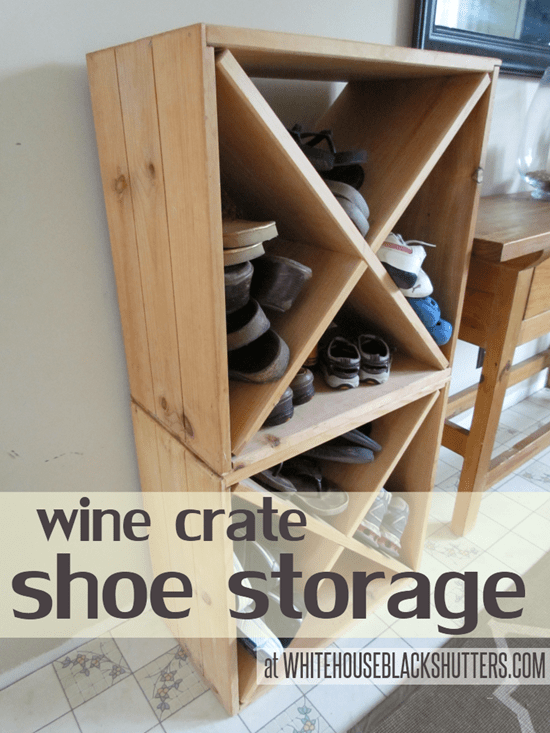 To this day, we’re still using those wine storage crates for shoe storage! Make sure your storage solution doesn’t just hide the problem (example: shoving papers in drawers). Let your storage solution give items a place and constantly work to put things away and keep them from stacking up. This is what keeps you from making progress. 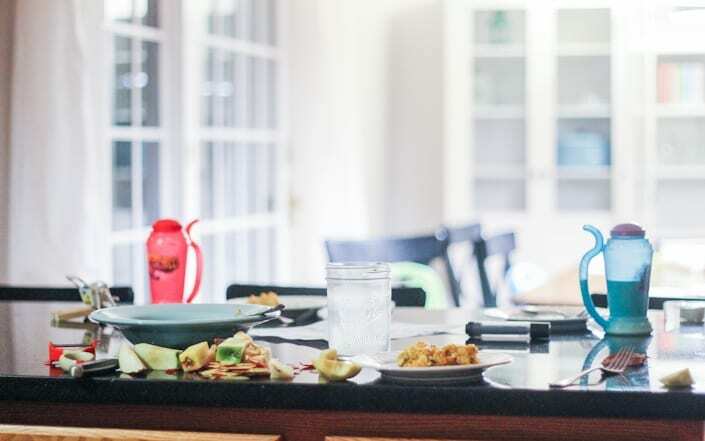 Not the kids making messes, not your spouse, although they help contribute. You are being way too hard on yourself and need to give yourself a break! 🙂 When I am stressing over it, I end up feeling overwhelmed, and put it off. An example, our kids toys are always out and being played with. But we have a place for everything, and a toy storage system that makes it easy for them to clean up, it isn’t an issue. My office/craft space is another place where we’ve figured this out. The trick is to have a solution where it will be EASY to get back to that clean state, again and again. Love your office. Pretty. Functional. Fun. Very nice! Great ideas! I love number 6 find out what isn’t working and fix it! I feel like this is where I get stuck, I need to put more shelves in my closet and stuff like that so that when I organize things can stay organized! #3 made me laugh. I remember, though, when we lived on a farm, how we used to hate going up to the root cellar one winter to sort potatoes when they had begun to spoil. It was dark, dirty and cold in there. We took turns but it just wasn’t much fun (and rotten potatoes are no fun to deal with). Then I went up once to help my dad when it was his turn. He had brought a bright propane lantern instead of the weak kerosene ones we were used to using; he invited me courteously to choose a bucket to sit on; he had provided a battery-powered cassette player so we could enjoy music; and when I had settled in, he produced a thermos and offered me a cup of tea. It’s one of my fond memories of those days. what a cool dad and a beautiful memory…. Wow these are great ideas!! !